Reboot! It's not just a memorable television show from our nostalgic past but a buzzword that gets thrown around more often than I can take a piss. Rebooting is exactly what it sounds like. The intention is to restart a franchise and give it new legs which usually involves redefining the series as well. Thanks to the sheer amount of rebooting going on in different media (The film industry being rather notorious for this), the term has gained a negative connotation. Is the term deserving of disdain or should we hold out hope for our nostalgia to be reunited with something we once cared for? Before we dive deeper, let's take a look at a successful and recent reboot. Mortal Kombat was released in April of 2011 and sales skyrocketed right out of the gates. Not only is the title itself rebooted (Mortal Kombat instead of MK9), the style, the game design, and even the story itself has relaunched the series as a newborn. This reboot has done double duty (not that kind) by luring back the Mortal Kombat players of old and siren singing in all new generations of gamers. As a side note, let's not forget that the movie franchise is going to reboot as well. 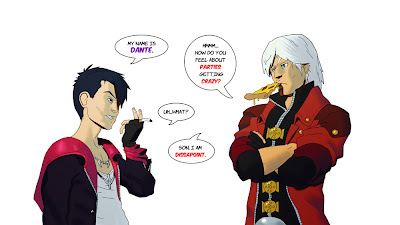 Now let's take yet another glance (If you missed out, check these links here and here) at the reboot that's raising hell: DMC. The Devil May Cry series has a strong fan base that isn't quite keen on the current reimagining of the series or its protagonist Dante. While the title isn't out yet (and so comparing MK9 with DMC is out of the question), it hasn't garnered the reception that Capcom and Ninja Theory were hoping for and this heavily shaky start to a reboot might ruin the eventual launch of the game. Two other upcoming titles are notable reboots: Tomb Raider and Twisted Metal. Tomb Raider has quite the challenge ahead as it needs to distance itself from the Uncharted series at all costs (which is the current top dog in games based on raiding tombs). So far it seems that the survival aspects of the gameplay will be the primary focus of the title which could be the distance it needs but only time will tell. Twisted Metal currently has no competition and with David Jaffe at the helm, there's plenty of potential here. I've only scratched the surface of recent and upcoming reboots but I want to hear your thoughts. To reboot or not to reboot? That is the question. Also: what franchises do you believe deserve a reboot? This is Kylak signing out and wondering how you feel about parties getting crazy.